A new report from the World Health Organization and the World Bank, the “World Report on Disability,” calls for the elimination of barriers that often force people with disabilities to “the margins of society.” About 15 percent of the world’s population – some 785 million people – has a significant physical or mental disability, including about 5 percent of children. Full text of the report is available here. The report calls for innovative programs and policies that empower people living with disabilities and remove the barriers which prevent them from participating in their communities, getting a quality education, finding decent work, and having their voices heard. A practical manual for doing exactly that, Hesperian’s A Health Handbook for Women with Disabilities, is filled with descriptions of activities and programs that have been proven to work in a multiplicity of settings. How to defend against violence or abuse. 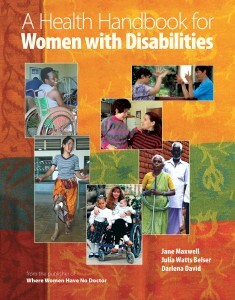 You can read more about A Health Handbook for Women with Disabilities here. All of our titles are available in Spanish here. Other relevant Hesperian publications include Disabled Village Children: A Guide for Community Health Workers, Rehabilitation Workers, and Families; Helping Children Who are Deaf; and Helping Children Who are Blind.